Where to leave bags after you've checked out of your hotel, or when you want to avoid hauling heavy suitcases across the city. ABOVE: A sign marks the luggage office at Venezia Santa Lucia Railroad Station. 1. When possible, use your hotel. 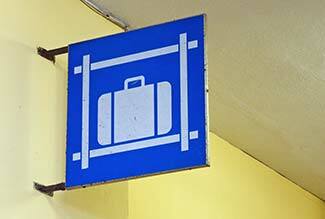 The easiest way to store luggage is to leave it with your hotel's front desk. Nearly all hotels will hold bags for a few hours before you check in or after you check out. At smaller hotels, you can simply leave bags with the receptionist; at larger or more expensive hotels, you'll need to store bags with the concierge or luggage porter (who should be tipped for the service). Suggestion: If you have an early departure, have mobility problems, or are just spending a night or two in Venice at the beginning or end of a cruise, we strongly urge you to consider staying at a hotel near your point of arrival or departure. (See our No. 1 Venice Hotel Warning.) This is far easier than hauling luggage through the streets, on crowded and high-priced water buses, or in even more expensive water taxis. For hotel suggestions, see our Venice Airport Hotels, Venice Railway Station Hotels, and Venice Cruise Terminal Hotels articles. 2. Otherwise, use a deposito bagagli office. The Venice Santa Lucia Railway Station, near track 1. (The last time we checked, hours were 6 a.m. to 11 p.m.) If lines are long, try this independent baggage office just outside the station. The Piazzale Roma (where airport buses, taxis, and People Mover trams enter and leave Venice). The Venice Cruise Terminal's Marittima and San Basilio buildings, where left-luggage offices are normally open on days when cruise ships are arriving and departing. On the Calle Larga Malvasia by the Hotel Canaletto, where Venice Luggage Deposit has an office within walking distance of the Rialto Bridge and the Piazza San Marco. Show this page on your smartphone or tablet for a discount. On the Rio Terà Sant'Andrea, alongside the People Mover station just off the Piazzale Roma, where Portabagagli da Kuddus is open from 8:30 a.m. to 8 p.m. daily. ** For current rates and hours of the deposito bagagli offices at Piazzale Roma and Marco Polo Airport, see the Cooperativa Trasbagagli Venezia's English-language Web site. 3. Introducing a newer option: Luggage lockers. Three different locker services offer a total of five locations in central Venice. See Venice Luggage Lockers for listings, with reasons why you might (or might not) find lockers a better bet than conventional luggage storage.